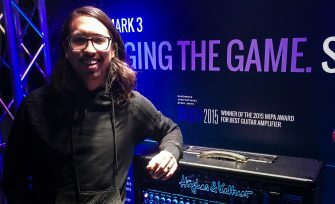 Phil Manansala, lead guitarist in metalcore superstars Of Mice & Men, has officially joined the Hughes & Kettner artist roster! Phil, who says he’s wanted a TriAmp ever since he was a kid, is now the proud owner of a TriAmp Mark 3 which he’ll be taking with the band across the world and into the studio in 2017 and beyond. Of Mice & Men have a bunch of massive festival dates scheduled for this summer and will be releasing new material in the near future too, and the blue lights should be all over everything. In the five years they’ve been together, Of Mice & Men and Phil have hit No. 1 on Billboard’s Rock and Independent Charts and No. 4 on the genre-spanning Top 200. They’ve also racked up over 150 million Spotify streams, 20 million YouTube views and 5 million social media followers, and have shared stages with the likes of Metallica, Queens Of The Stone Age and Linkin Park. Safe to say we’re pretty ecstatic to have Phil on board then – welcome to the family! And check out TriAmp Mark 3 right here!